A flood, and a granite stone, bind the communities of Leduc and Grimma, Germany. 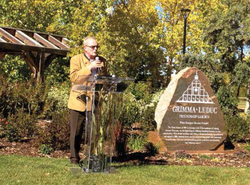 On Sept. 15, a plaque dedicated to the community of Grimma was unveiled on a stone found in the Robinson subdivision of Leduc, during a ceremony in the Stone Barn Garden, further cementing the relationship between the two communities which started when a local resident happened to be in Germany in 2002. When Koenig returned from his trip, he spoke to other German-born residents of Leduc about the devastation he saw, and together they raised $35,000 for relief. Those dollars were matched with funds from the Wildrose Foundation, and $70,000 was sent to Grimma from Leduc. With that donation, Grimma was able to work on rebuilding, and the first step of a friendship and partnership between the two communities was taken. Located 25 kms from Leipzig, Grimma has around 30,000 residents, and is a small city surrounded by agricultural lands and a major industrial centre. Realizing how alike the two communities are, and how each could benefit from partnerships with the other, Koenig approached Pat Klak, past executive director of the Leduc-Nisku Economic Development Association, about furthering relations with Grimma. “He came in, said I should write a letter to Grimma,” she said. “I said that’s a wonderful idea. He said, ‘you should do it now.’ ” Klak did and over the last few years, there have been visits to Grimma from Leduc delegates and delegations from Grimma to Leduc. The plaque that was erected in the Stone Garden is dedicated to the people of Grimma for their strength in overcoming disaster and moving on, while also taking time to enjoy the beauty of nature. “The gardens and yards in Grimma are just amazing,” said Leduc Councillor Beverly Beckett. Wolfgang Hoffman, a resident of Munich was visiting family in Leduc and happened to be at the garden ceremony.